Why Do You Need VenAqua? Home / Why Do You Need VenAqua? Most developed countries around the world have some kind of meters set up to calculate their water consumption. In our country though, our water payments are static. An arbitrary amount is levied, and regardless of our actual consumption, we pay it. As a result, how much water we actually use and how much we pay for it has no co-relation whatsoever. Because of this arbitrary nature of our water charge, a nuclear family of one adult and one child might pay the same as a family of four with two adults and two teenagers. How unfair is that! But no longer would you be penalised for someone else’s excess usage. Introducing VenAqua, which can measure your usage of water and bill you accordingly. You never have you pay a single paisa more, ever again! How Does Your VenAqua Work? So you are living in a residential community of more than a hundred apartments. How does your VenAqua get to work? VenAqua is suitable for multiple inlets and no changes to your existing plumbing is necessary. We place sensors in every inlet of every house. 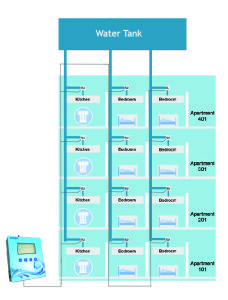 The system groups together all water inlets in a particular house and gives a consolidated reading. Each inlet has an unique id and we would set up an electronic networked solution like shown below. A single cable leads to the metering unit, which can be placed in your maintenance room.